Are you a MacBook Air owner like me? Then I’m sure you’ve come across a deficit of ports when you need them. You plug in a USB drive, then you use the Apple E-Net (Ethernet) connector to connect to the web (because it is faster than wireless), and then you want to copy to a second external drive. What do you do? Well, the only thing you can do is copy from one drive to your Air and then plug and unplug the externals until you’ve made the copies you wanted. Only having two USB ports, and no built in E-Net port, on the Air can certainly limit some activities. Let’s back up a bit. Last year I bought myself the Apple to E-Net USB converter ($29.00 Apple Store) and I was using the converter to connect to my hardwired network which is faster than Wi-Fi. Then, like most Apple users, I began to plug other peripherals into my Air. Hard drives, USB thumb drives, the USB/E-Net converter, and even a DVD drive to burn some CDs (remember those?). This quickly became a problem if I wanted to do all of that stuff at once. Not enough ports on a MacBook Air. Then I found the MACALLY 3-Port USB 3.0 Hub + and my problems went away. I can imagine that this kind of message would disturb some, plus, I am not a fan of “drivers” in general since I have had update issues when moving from one Mac OS to the next. 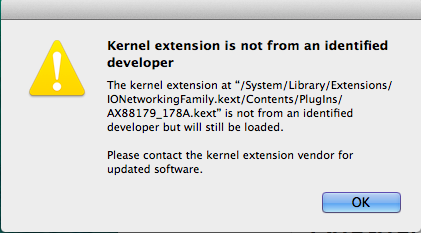 So I deducted a point in my MyMac rating for these two reasons. The hub is a simple device. Plug it in to one of your two USB 3 ports (the unit is backward compatible with USB 2) and you immediately have three available USB 3 ports, plus an Ethernet port. 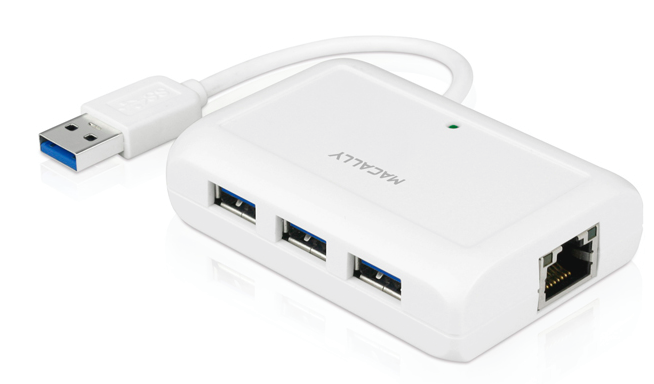 This gives you four USB ports to use and the connector you need to make that hard wired network connection. Better still, the hub comes with a power adapter so you can plug it into a wall outlet and not have power sucking peripherals drain your precious MacBook Air battery. The hub does work with or without being plugged in to a power source. An active LED located on the top of the hub tells you the unit is alive. LEDs located on either side of the E-Net port tell you that you have a good connection (Green/blinking) while the other LED tells you how fast that connection is. The Amber light is on when connected to a 1000 Mbps network and off when connected to a slower network. An interesting item to note is the Apple to USB/E-Net converter ($29.00 Apple Store) only delivers the slower Base 10/100 -T Ethernet speeds. During my testing I used all three USB ports at once, plus the Ethernet port and had no slow downs, errors, or issues of any kind. The hub worked flawlessly. 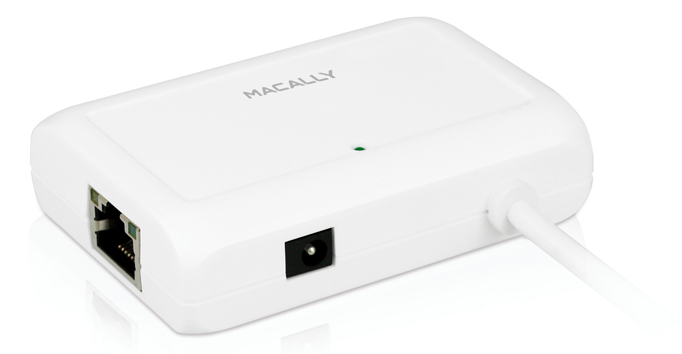 If you have a need for more port access when using your MacBook Air, or your MacBook Pro, I can highly recommend the MACALLY 3-Port USB 3.0 Hub +. The hub comes with a connected USB cable, power adapter, and delivers E-Net connection speeds of 10/100/1000Mbps. Also, the USB ports are capable of USB transfer rates up to 5Gbps and all ports are hot swappable. Loading of the drivers could use a little improvement but other than this one issue, I find the hub extremely useful.